Crawling with Zombies by Gerry Conway. The Hardy Boys: The New Case File. Review: I'll wager that you've never seen Joe Hardy as a zombie before! 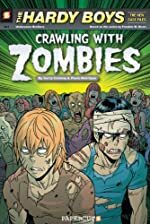 That all changes in Crawling with Zombies by Gerry Conway. This is the first book out of a new graphic novel series called The Hardy Boys The New Case Files based off Franklin W. Dixon's original Hardy Boys. Unlike the original, this book is a graphic novel. Frank and Joe once again will track down dangerous criminals as the world's favorite undercover team. Frank and Joe Hardy are back! In Crawling with Zombies, they must once again track down ruthless criminals. Local teenagers are having "zombie fests" where teens dress up as zombies and terrorize local establishments. Usually, they're harmless. This time, some have almost died and endangered others in the process. Some unknown force is driving them and controlling them. Join the most famous undercover team of the century in tracking down the unknown force compelling the teenagers. Frank and Joe get in with the crowd by dressing up with the teenagers and mysterious events start to unfold. Join these two brothers as they track down criminals and bring them to justice. Gerry Conway does an excellent job writing Crawling with Zombies. Don't be alarmed by the cover; it's just make-up tricks and false masks to make teenagers look like zombies! I was hooked right away. The Hardy Boys by Franklin W. Dixon were always some of my favorite books. This is the first book in a series and is based on The Hardy Boys. Gerry Conway does an excellent job of writing the story and imitates the way that the original author wrote. He's enthusiastic and makes the plot interesting and compelling to read. Paulo Henrique is the illustrator of this comic and does very well illustrating. The masks look very realistic in the book and make it interesting to read. Join these two brothers as Frank and Joe once again track down dangerous criminals and bring them to justice. We would like to thank Papercutz for providing a copy of Crawling with Zombies for this review. Have you read Crawling with Zombies? How would you rate it?